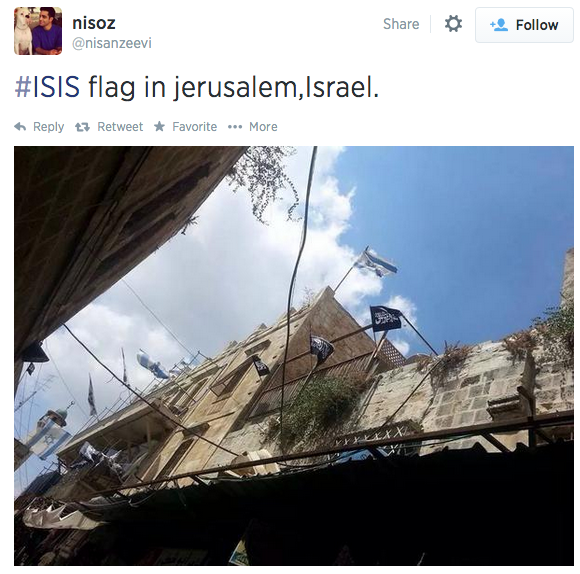 An article at Times of Israel claims to have spotted the ISIS flag in Jerusalem. Not everyone is so quickly convinced. Responding to this Tweet Elizabeth Tsurkov noted “it’s a flag used by many Islamist movements. The seal of Muhammad is what appears on ISIS flags.” But to read the bits making the rounds at various websites, such as Jewsnews, there is no doubt. 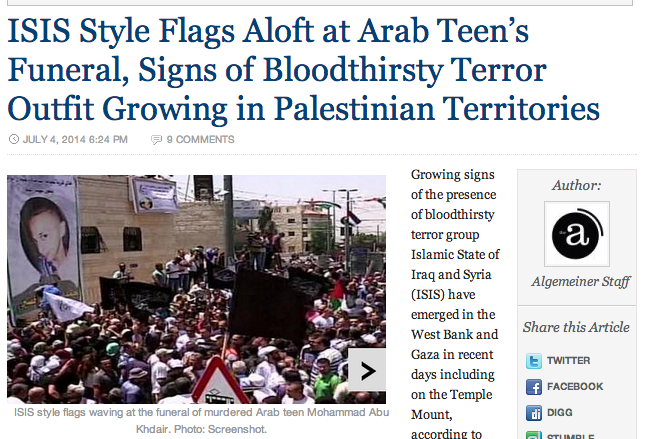 The original reports actually stem from the funeral of Shuafat resident Mohammed Abu Khdeir. At his funeral on July 4th, after he was brutally murdered by an alleged gang of Jewish extremists, many black flags were flying. This was “growing signs of the terror group ISIS” in our midst. I initially reported this on Facebook and began to make inquiries. 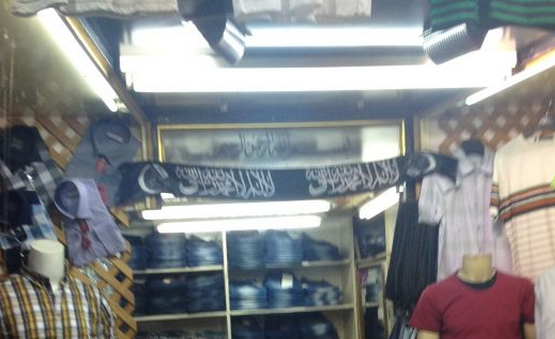 According to those interviewed they were not ISIS flags but Hizb ut-Tahrir flags. 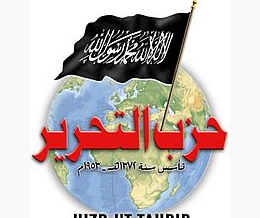 It turns out Hizb ut-Tahrir, an international Islamist movement, was founded in Jerusalem in 1953 by a man with the long ponderous name Muhammad Taqi al-Din bin Ibrahim bin Mustafa bin Yusuf al-Nahbhani. He died in 1977 but his movement gained strength in Jerusalem in some circles. This is against the backdrop of the failure of Fatah and Hamas to mobilize in Jerusalem the the banning of PLO institutions from the city. Some people re-oriented themselves toward a global Islamic ‘ummah’ rather than national politics. Since Jerusalem Palestinians cannot vote in the Knesset elections and only 2 percent vote in city elections, and probably fewer than 15 percent participate in Palestinian politics, it is a logical choice for some. But the real origins of the ‘black flag’ goes back further than 1953. The concept of the ‘black banners’ in Islam is a concept from early Islam. Arabic scholar Moshe Sharon even titled his book ‘Black Banners from the East‘ about the rule of the Abbasid dynasty. In an intro to the book it is noted “It is the story of a messianic movement striving and succeeding in establishing the throne of its Caliph-Messiah.” Of course this seems to rings bells about ISIS and other Islamist movements. 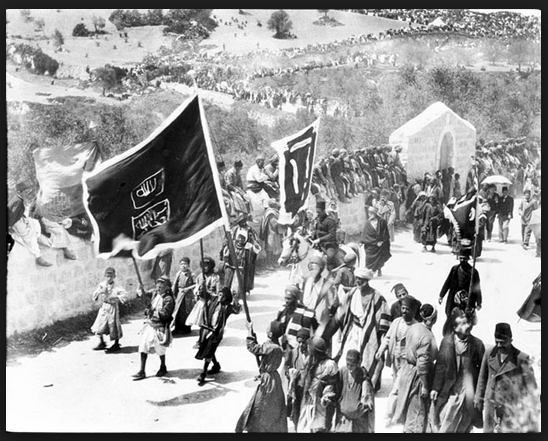 In terms of Palestinian history, the black banner was already common in the land in 1900 during Nabi Musa celebrations. So when we think of black banners in Jerusalem or black flags. ISIS may come to mind. But it might be worth to inquire with the news media if they even bothered to investigate. Did they confirm it is ISIS? Is ISIS on the doorstep of Jerusalem? It is easy to see one thing and think another, to be deceived easily. Maybe the black banners of ISIS will become common, or maybe they won’t. But it is worth recalling that Hizb ut-Tahrir for all its Islamist ideology has not been involved in terrorism or the kinds of extremism that ISIS is involved in. Lumping all these movements together may not be accurate or helpful in understanding them. A little sense of history might.